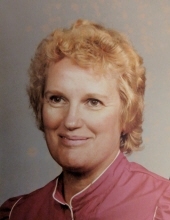 DURHAM: Delphine Kean, 83, passed away on Friday, October 26, 2018 at Carver Living Center in Durham. She was born in Patchogue, NY to the late Guy Richmond and Cora Baker Rogers. In addition to her parents, she was also predeceased by her husband, James Kean; and two sisters, Shirley Tracy and Lorraine Williams. Ms. Kean is survived by her daughters, Diane R. Riccione, Debra Anne King (Paul); granddaughter, Katherine Riccione; three sisters, Priscilla Mitchell, Corinn Chambless and husband David and Terri Beer and husband Don; and numerous nieces and nephews. A memorial service will be held at 11 a.m. on Tuesday, October 30th at Clements Funeral Home in Durham with Mr. John Hill officiating. To send flowers or a remembrance gift to the family of Delphine Kean, please visit our Tribute Store. "Email Address" would like to share the life celebration of Delphine Kean. Click on the "link" to go to share a favorite memory or leave a condolence message for the family.